My three part tour with Louis Latour began in the Latour heartland in the Côte d’Or before visiting Simonnet Febvre at Burgundy’s northern limit in Chablis. Now, the journey reaches as far south as it is possible to go in Burgundy, to the vineyards of Beaujolais. Some may argue that Beaujolais is not Burgundy, but to all intents and purposes Beaujolais is Burgundy’s southern extension, and indeed some wines produced in Beaujolais have the right to be labelled as Bourgogne. The similarities, both historic and contemporary, probably outweigh the differences. In Beaujolais, Louis Latour is represented by its Henry Fessy outpost. 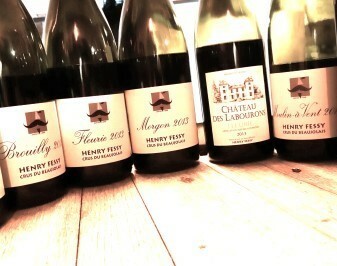 Latour acquired Henry Fessy in 2008. The formidable sounding Henry was still making the wines here until he retired in 2009, his fabulous moustache becoming the logo of the house. Today Fessy owns or has long term control of 70 hectares of Gamay and Chardonnay vines, plus it buys fruit from around 30 more. 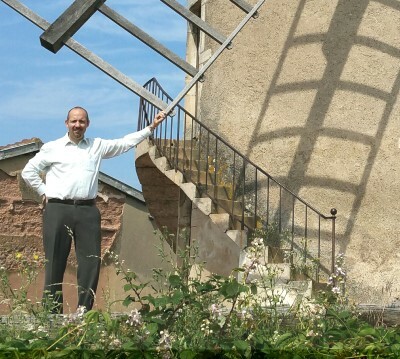 My first stop was in the village and appellation of Fleurie, where I met up with Henry Fessy’s hugely enthusiastic winemaker and guiding light, Laurent Chevalier, pictured right with a little piece of the Moulin à Vent. We walked through the Fluerie vineyards, the soil a deep pink sand of decomposed granite. Laurent explained that his Cru vineyards (Beaujolais top village-designated wines) are always on granite or occasionally slate, though in patches there is also limestone that, whilst the key soil of Burgundy for Pinot Noir, rarely give the best expression of Gamay here in Beaujolais. Winemaking here is traditional, and not the carbonic maceration used to produce Nouveau and favoured by many producers. Wine is made with 80% whole bunches going into the fermentation tanks, all inoculated with yeasts, and remontage, or ‘ pumping over’ as required, normally once per day. Tanks are temperature controlled, with a short maceration “To preserve fruit and not to have too much extraction,” says Laurent. Some cuvées do see oak maturation, but little of it is new oak. See all UK retailers of Henry Fessy on . Note that it is a ‘quirk’ of Beaujolais that the wines of the 10 Crus tend not to put the word ‘Beaujolais’ on their labels, but make no mistake, these are Beaujolais wines, all made from the Gamay grape. From a one hectare vineyard, this is unoaked Chardonnay. Quite a rich nose with a touch of leesy quality and some fruit skin richness. The palate offers a flood of sweet fruit and is really quite creamy in texture. There is good balance here, perhaps a little twist of bitter lemon adding a grippy feel. 86/100. From a vineyard belonging to the Fessy family. Very appealing lift and cherry freshness, a touch of bubblegum and classic Bojo aromas. The palate has a really nice creamy fruitiness., it is a full and ripe style with a good depth of fruit. Lovely lift and freshness and that violet, kirsch and intense blueberry fruit character. Very delicious. 88/100. From 60-year-old vines in their Regenie estate. A lovely nose again, not too much weight or heaviness here – and no oak – but has more power and structure than the Villages, still a little floral lift, but it is more structured, more concentrated and a touch earthy. Quite substantial on the palate, a slightly currant quality of fruit. Fresh and tasty, but perhaps lacking just a touch Beaujolais softness and freshness. 87-88/100. From the home of Henry Fessy, where they have their largest vineyard holdings and their biggest cellar. There is an earthiness to this again and a small red fruit character. The palate shows plenty of orange and lemony acidity, plenty of fruit at the core, though fairly straightforward. Long with a touch of spice. 87-88/100. More lift and fragrance here, a creamy and smooth cherry fruit and none of the earthiness of the Regnie for example. Lovely freshness and cut, more sappiness and freshness, arguably not as much fruit depth, but I like the elegance and freshness of this. 88/100. Spicy and briary, there’s a nice lift to this, but not so much floral as spicy and a touch exotic. Very fine red fruit palate, with a real concentration of fleshy red fruits, a firm tannin background and lovely freshness with the acidity and bittersweet twist of cherry skins and plum skins. 89/100. When Laurent arrived, the wine from this Chateau was made in big old wooden vats, but to ensure quality and consistency Laurent changed those to steel, but matures the wines with 5% new barrels and 5% older barrels from Latour’s Burgundy cellars. Nice Beaujolais lift of violet and kirsch here, the oak not really evident. It jas real smoothness and elegance on the palate, a very orangey bright acidity, but a nice flowing and elegant freshness of red fruit. 90/100. Described by Lautent as a difficult vintage with frost, hail and a very small crop. Pleasing delicate briar and meaty nuances to the quite solid black and red fruit. Fine sweetness and elegance of the fruit, quite charming with a touch of sappiness and an edge of endive bittersweetness and espresso, making it quite Pinot-like. Not so Beaujolais, but it is lovely. 89/100. 23-year-old Beaujolais Cru with an old wine, brown sugar and currant suggestion of sweetness on the nose. The palate has lost most of its tannin structure, but the acidity is balance and it has a fine spiciness and great sweetness of fruit. Lovely in its way. 88/100. Served from magnum. There’s a touch of currant and vanilla sweetness, with some flowers and lots of charming Pinot-like sweetness, the palate showing good balance of tannins and acids, and a sweet and ripe fruit character, and good juiciness and spice, dry but balanced. 89/100. A pleasing, racy character, with some game and truffle, but the orange and cherry freshness coming through. Fresh and straightforward, but good structure and length. 88/100. 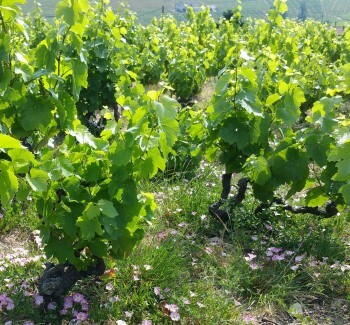 Named Brulees or “burned” because lightning strikes often and has fairly regularly incinerated a vine or two. “Perhaps the lightning means there is iron in the soil,” muses Laurent. Very nice intense nose, lots of almost blue/black fruit with blueberry and blackberry, even fresh raspberry lift, and a firm spicy palate, Tight and structured, with lots of grip but lovely legth and tension as well as silky tannins. 92/100. This wine is made in Beaune from less than one hectare of old vines Pinot Noir that were purchased and planted in Beaujolais in 1971. A touch reduced, but there is a nice touch of game and mushroom over delicately spiced black fruit. Nice fruity lift. The palate has juiciness and nice fruit, and a firm backbone, and is very well done. 89-90/100. Haf way through malo so tough to judge. Good fruit sweetness and a nice Pinot briar note.